I hope you're doing very well. I am not sure if this is the correct forum to post this note; however, my apologies and feel free to move or delete it if not. This is the story about The Old Lady; a 1958 Volvo PV 444 L – one of the last of its kind. Follow her restoration; started by dad in the ‘70’s and completed by son in 2013, with assistance from and credit to old Volvo and other car enthusiasts met along the way. Is your name listed in the pages? Besides the unique narrative, chapters include information on car and part sources; initial inspection, inventory, dismantling, restoration and reassembly processes; Internet research tips; necessary tools and equipment; FAQs, and parts cross-reference. Learn tips and tricks from over eight years of work, including a few mistakes, captured in detailed notes and nearly 90 high-resolution images. 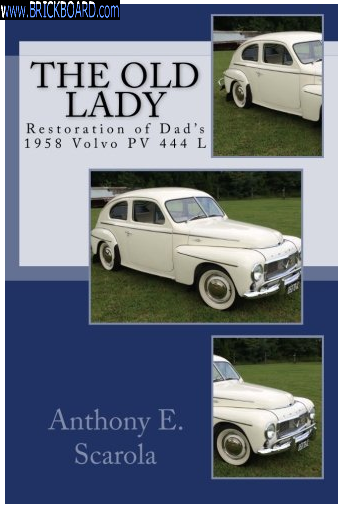 Use this resource to guide you as you restore your own Volvo PV 444, 544, 455/Duet/P210, or older classic Volvo vehicle. Truly a must-have for any Volvo PV owner! Thanks for your time and I hope you enjoy! Obviously belongs at the TOP of ANY pile of vintage Volvos, no matter the colors. As they say, "the check is in the mail..."
I joined this forum to see if I could get some practical tips for a well-maintenanced Volvo sedan that I recently inherited from my Mom. Happened to see that you are also a Virginia Beach resident, and thought you might be able to make a knowledgeable referral to an excellent Volvo repair shop -- aside from the Beach Volvo (Wynne)? Luckily, my insurance will cover the internal and external damage connected with the deer collision. If there are any local Volvo repair shops you would be able to confidently recommend, aside from the local VB dealership, I'd love to know about them. Jenny, the OP hasn’t been inline since he posted the one message in 2015. A PM might get his attention, but you probably don’t have enough posts to do that. Suggest you try and find Anthony by another means. If you buy the book, kindle version is about $5, he lists the service shops that provided assistance.